Bodies on the beach. It's hot in Menton, very hot. It feels like August yet it's still June. The lady in the second photo sells clothes and jewelry so if you are bored with topping up your tan, you can go buy a dress. Des corps sur la plage. Il fait chaud à Menton, très chaud. On se croirait au Août pourtant on est encore en Juin. 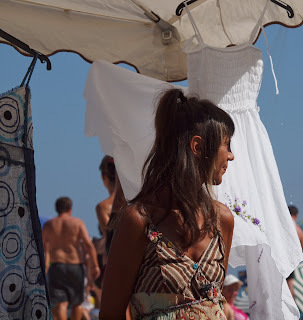 La dame dans la deuxième photo vend des vêtements et des bijoux, donc si vous vous ennuyez pendant votre séance de bronzage, vous pouvez aller acheter une robe. They have some vendors on the beach in Tamarindo as well, but they sell Chorotega pottery and jewelry, not clothes. I like how you got a male and a female in the photo. Oh, yes, so hot... I'm already longing after september and rain! Love the way you've captured the heat in the first picture Jilly, you can almost feel the heat!! that top shot is beautifully composed and conveys the sense of heat brilliantly. Have all the "Paris Match" paparrazi turned up in Monaco for the wedding yet? Nice candid shot. Looks like these lucky people are really enjoying themselves. Don't forget Jilly, drink lots of fluids. Take care. I, too, like that top shot and the sepia (yes?) image. THe top photo knocks my socks off Jilly. You just get better and better. The top photo is wonderful. My dermatologist would go nuts. No hats, no shirts, and probably no sunblock. He told me recently I must wear a hat when I am outside. Sigh.